vacuum pump conveying grains- Vacuum Pump - EVP Vacuum Solution! Roots blower is a volumetric rotary blower, which uses two blade-shaped rotors to move relative in the cylinder to compress and convey gas. The blower is simple in structure and convenient in manufacture. It is suitable for gas transmission and pressure in low pressure situations, and can also be used as a vacuum pump. Roots blower is a volumetric rotary blower, which uses two blade-shaped rotors to move relative in the cylinder to compress and convey gas. The compressor keeps the two rotors in mesh by means of synchronous gears at the rotor shaft end. The working volume of each concave curved surface part on the rotor and the inner wall of the cylinder is composed. During the rotation of the rotor, the gas is taken away from the suction port. When it is moved near the exhaust port and connected with the exhaust port, the pressure in the working volume rises suddenly because of the high pressure gas recirculation, and then the gas is conveyed to the exhaust channel. The two rotors work alternately in turn. The two rotors are not in contact with each other, and they are sealed by tightly controlled clearance, so the exhaust gas is not contaminated by lubricating oil. 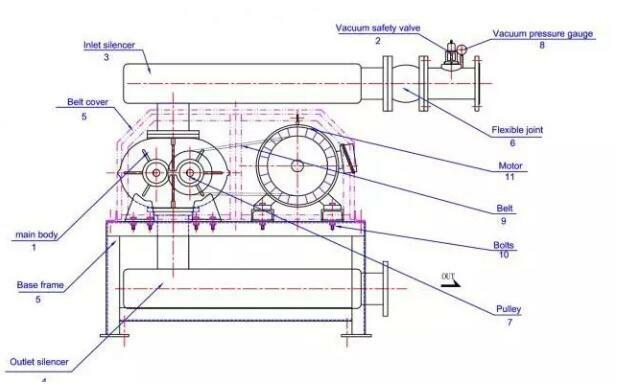 Roots blower is composed of four parts: casing, wallboard, impeller, import and export muffler, etc. Fan structure drawing housing: Mainly used for supporting wall panels, impellers, mufflers and fixed functions. Wallboard: Mainly used to connect the chassis and impeller, and support the rotation of impeller, as well as the effect of end sealing. Impeller: It is the rotating part of Roots blower. It is divided into two and three leaves. However, because the three leaves have many advantages, such as less air pulsation, less noise and smooth operation, it has gradually replaced the two-leaf Roots blower. Muffler: To reduce the noise caused by the air pulsation in and out of Roots blower. Because of the three-blade rotor structure and the reasonable structure of the inlet and outlet in the shell, the fan has low vibration and noise. The impeller and shaft are integral structure and the impeller has no wear and tear. The performance of the fan remains unchanged and can run continuously for a long time. 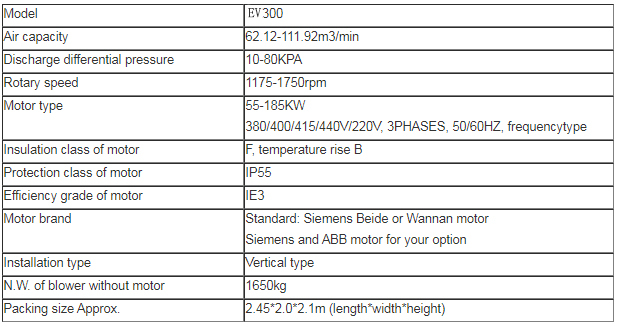 The fan has large volume utilization ratio, high volume efficiency, compact structure and flexible installation mode. The selection of bearings is more reasonable, the service life of each bearing is even, thus prolonging the life of the fan! The oil seal of fan adopts imported fluorine rubber material, which has high temperature resistance, wear resistance and long service life. All kinds of machines can meet the needs of different users for different purposes.